This little bracelet plays the game for you, more or less. 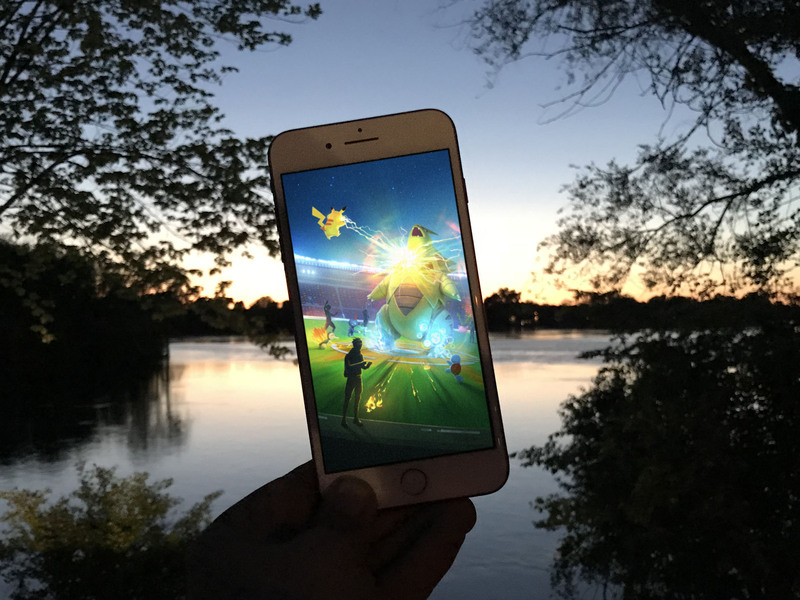 The best part about Pokémon Go is the way it gets me out in the world and playing. I will walk for hours with my kids and have a blast taking down gyms with them or catching dozens of creatures in search of a shiny variant on Community Day. But when it's just me riding my bike or wandering around an unfamiliar city for work, I'm either unlikely to remember to play or unable to because my hands are busy. I've used the Pokémon Go Plus and the Pokémon Go app on my Apple Watch, but neither are particularly convenient or useful on my bike. But Go-tcha is something different. It looks like a Fitbit but acts like of something totally different. It lets you play Pokemon Go from your wrist, and if you let it, Go-tcha will even play the game for you. Which may or may not be a good thing. Instead of constantly tapping a brightly-lit button on your wrist, Go-tcha auto-plays parts of the game for you with the help of a simple app. With this small thing on my wrist, I can play Pokémon Go without anyone around me knowing what I'm up to. Instead of the bright light coming from the Pokémon Go Plus, I get a dimly-lit LED display and a small vibration. Instead of a big button, I get a small touch sensor. I can quickly slide my finger across the glass and do everything I'd normally do with a Go Plus bracelet. There are simple animations on the display to tell me what I've done if I want, or I can just check the journal in the app later. For looks alone, I greatly prefer this to the more kid-friendly Go Plus. I've caught more creatures, checked in at more stops, and logged more kilometers walked in the last few days than I have in the last few weeks. But there's another mode to this accessory, enabled with a third-party app you install on your phone. Instead of needing to touch the bracelet at all, you just turn on auto-play. These toggles let Go-tcha spin Pokéstops and catch Pokémon around you automatically. It's fast, too. I've caught a dozen Pokémon in minutes without touching my wrist at all. This all works because Go-tcha tells the app it's a Go Plus. Pairing to the phone, connecting through the app, everything thinks I'm connecting an official Go Plus. That means it connects just as easily as the official accessory, which is convenient but feels a little dishonest. There's no denying this accessory is remarkably effective. I've caught more creatures, checked in at more stops, and logged more kilometers walked in the last few days than I have in the last few weeks. And the battery life on this accessory is exceptional, I'm three days in and it's still going. To be honest, using this thing feels like I'm cheating. The way this accessory connects to my phone is dishonest. The unofficial app, which is used for settings and to update the app, is clumsy and kind of deceptive. The game clearly has no idea this is being done automatically, as the notifications it gives are exactly the same as what you get when using the official Go Plus. And because everything is based on the Go Plus, this unofficial accessory is just as unstable and temperamental. It disconnects with apparent randomness and doesn't always do exactly what it is supposed to do. The Go-tcha display isn't big on clearly explaining all of its features either, leaving you with some cryptic images and a long press-based UI to get everything done. There's not exactly a user manual in the box, so you mostly use online videos and brief graphics to figure everything out. Go-tcha for Pokemon Go Should you buy it? For $35, Go-tcha fills in some of the gaps left by the Go Plus or Apple Watch app. I love being able to play while I'm dressed a little nicer than I would be when using the plastic parts of the official accessory. And, if I'm being honest, the auto-play mode is super helpful for when I'm riding my bike or in the middle of a meeting. But it's clear this is not an official accessory, and part of me wonders if Niantic might eventually disable its functionality entirely and render my purchase worthless. Until that happens, however, I have no doubt many will find this accessory worthwhile.